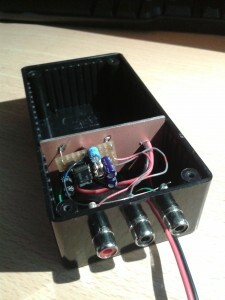 Inside view of my stereo to mono converter. My TV camera generates stereo audio, like most cameras do. However, my local ATV repeater only supports mono audio. So to transmit a nice audio signal with my TV pictures, I needed a way to convert the stereo signal to mono. 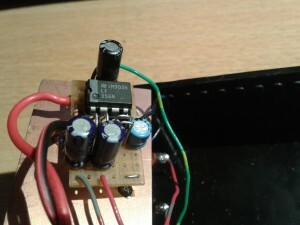 The circuit is a traditional opamp based mixer. The opamp suggested here is a TL072, unfortunately that chip was out of stock here. I found a nice replacement in my junk box: the LF356, although it has a different pin layout. Most opamp’s with FET inputs will probably do the job. Check out Peter‘s website for more details. Detail picture of the circuit board. This is my personal website, it reflects my personal opinion and has no relation to my job or whatsoever. 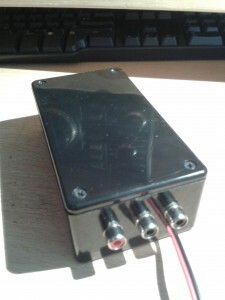 An appropriate amateur radio license is required to own and/or build and/or use the transmitters described on this website, depending on local regulations. All content on this website is licensed under a Creative Commons Attribution-NonCommercial 4.0 International License. Copyright © 2019 Ernest Neijenhuis PA3HCM Homepage All Rights Reserved.